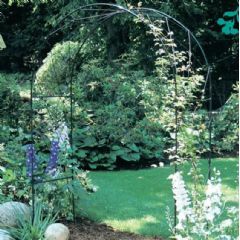 Provide a frame for roses and other climbing plants with the simple design of this solidly crafted metal arch. 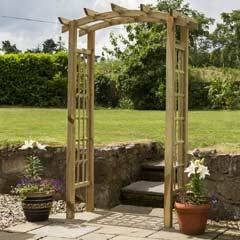 Frame your garden elegantly welcoming visitors to the garden. 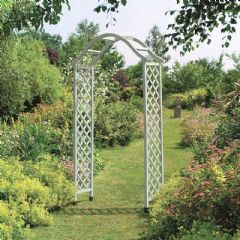 Powder-coated metal ensures that this arch is weatherproof and provides it with extra strength. 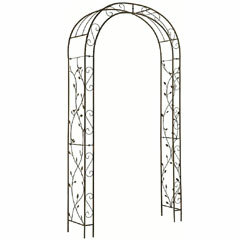 The detailing on this arch is of the highest craftsmanship with a criss-cross lattice design and spectacular roof. There is a lip on bottom of each leg allowing you to bolt into the ground, aiding in stability. 100% great item. Looks good in my garden. Best arch way yet. Greenfingers thanks. 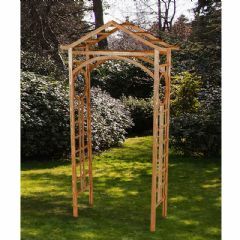 Really love this arch, it's well made and very sturdy, and it looks perfect in my garden. Late in reviewing, as late in assembling. Exactly what we were looking for. 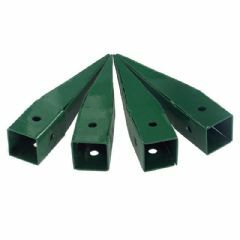 Excellent but with some caveats.You will need to cement it into the ground if bolting is not viable, as there is not much to hold it into the ground. Solid stuff, with a few minor dents, not really noticeable. Slight rusting on some joints/welding but very minor. Excellent value for money.If you think that grey doesn't "work" in your garden & that the metal would burn the plant leaves, as we thought. Well proved wrong works well & climbing plants climbing away. Very pleased with the arch. Bought it to replace a wooden one that had rotted. 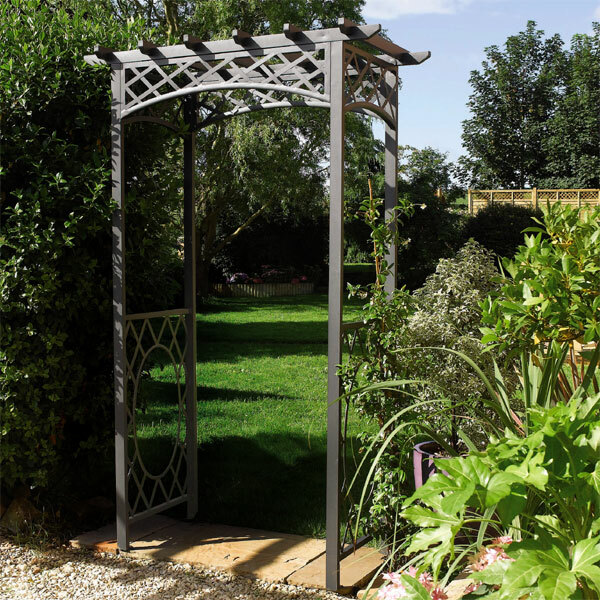 It was easy to construct and looks really good in the centre of our garden. 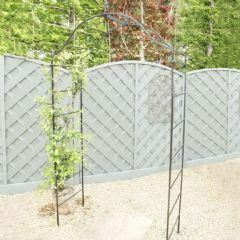 I bought this arch to replace a wooden one which has seen better days. My husband put it together which was simple enough. It is quite modern, and unbeknown to me, matches the colour of my bi-fold doors! I recommend it. The arch was assembled quite easily by myself, in approx one hour, the arch seems to be of high quality. The main concern as far as most people will have is the naff securing pins for fixing the arch into the ground! These are of no use at all, either supply more rigid pins or better still extend the length of the four legs by a few inches To fix my arch into the ground I will have to extend the legs in order to be able to cement the whole structure into the ground and feel the arch will remain totally secure and remain upright!